Yaxley aim to rescue a miserable end to the season by lifting the Hunts Senior Cup tomorrow night. 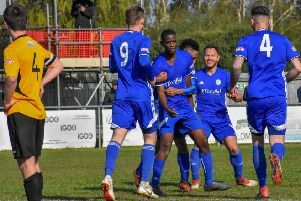 Yaxley tackle Godmanchester in the final at Huntingdon FC (7.45pm kick-off) and manager Brett Whaley is determined to end the Cuckoos’ campaign with some silverware in the trophy cabinet. Yaxley finished fifth in the United Counties Premier Division after struggling for form in the last couple of months. Godmanchester finished second in the Thurlow Nunn Premier Division. Whaley said: “If we play like we did in the first two-thirds of the season we will win the cup and if we play like we did in the last third we won’t. “The age of a small squad caught up with us in the last couple of months. The same players were having to play every game and it showed. “Overall we’ve done okay. We improved our league position by a place although it was disappointing that we didn’t finish as high as it looked like we would do, and we improved in the cups which was a major target. Yaxley midfielder Rob Hughes is suspended tomorrow. Neither team had to win a game to reach the final, but it should still be competitive. Yaxley were knocked out of the Hinchingbrooke Cup by Peterborough Northern Star at the semi-final stage last month and the city side went on to lift the cup this week after a 2-1 win over Deeping Rangers in the final. Phil Stebbing scored twice for Star with Jordan Avis replying for Deeping in the final minute leaving Rangers unable to send manager Tuncay Korkmaz into retirement as a cup winner. Oakham United proved they were the clear top dogs in the Peterborough Premier Divisionby thrashing Netherton United 5-0 in the League President’s Shield Final. Top flight champions Oakham were 2-0 up inside three minutes and 4-0 up by half-time as they bade farewell to the Peterborough League in style. The Chroma League Shield Final was also played at PSL last weekend with Division Five side FC Peterborough beating Stanground Sports of Division Four 1-0. Kamran Khan scored the only goal of the game from a free-kick, the concession of which led to a red card for Stanground’s Darren Maloney. FC Peterborough also won promotion in their first season in the Peterborough League.